Ansegisel (also Ansgise, Ansegus, or Anchises) (c. 602 or 610 – murdered before 679 or 662) was the son of Saint Arnulf, bishop of Metz, and his wife Doda. He served King Sigbert III of Austrasia (634–656) as a duke (Latindux, a military leader) and domesticus. He was killed sometime before 679, slain in a feud by his enemy Gundewin. Through his son Pepin, Ansegisel’s descendants would eventually become Frankish kings and rule over the Carolingian Empire. The son of the powerful Frankish statesman, Ansegisel, Pepin worked to establish his family, the Pippinids, as the strongest in Francia. He was able to realise his dreams by becoming Mayor of the Palace in Austrasia in 680. Pepin subsequently embarked on several wars to expand his power. He united all the Frankish realms by the conquests of Neustria and Burgundy in 687. In foreign conflicts, Pepin increased the power of the Franks by his subjugation of the Alemanni, the Frisians, and the Franconians. He also began the process of evangelisation in Germany. Pepin’s statesmanship was notable for the further diminution of Merovingianroyal authority, and for the acceptance of the undisputed right to rule for his family. Therefore, Pepin was able to name as heir his grandson Theudoald. But this was not accepted by his powerful son Charles Martel, leading to a civil war after his death in which the latter emerged victorious. Charles Martel (c. 686 – 22 October 741) was a Frankish statesman and military leader who as Duke and Prince of the Franks and Mayor of the Palace, was de facto ruler of Francia from 718 until his death. The son of the Frankish statesman Pepin of Herstal and a noblewoman named Alpaida, Charles successfully asserted his claims to power as successor to his father as the power behind the throne in Frankish politics. Continuing and building on his father’s work, he restored centralized government in Francia and began the series of military campaigns that re-established the Franks as the undisputed masters of all Gaul. After work to establish a unity in Gaul, Charles’ attention was called to foreign conflicts, and dealing with the Islamic advance into Western Europe was a foremost concern. Arab and Berber Islamic forces had conquered Spain (711), crossed the Pyrenees (720), seized a major dependency of the Visigoths (721–725), and after intermittent challenges, under Abdul Rahman Al Ghafiqi, the Arab Governor of al-Andalus, advanced toward Gaul and on Tours, “the holy town of Gaul”; in October 732, the army of the Umayyad Caliphate led by Al Ghafiqi met Frankish and Burgundian forces under Charles in an area between the cities of Tours and Poitiers (modern north-central France), leading to a decisive, historically important Frankish victory known as the Battle of Tours(or ma’arakat Balâṭ ash-Shuhadâ, Battle of the Palace of Martyrs), ending the “last of the great Arab invasions of France,” a military victory termed “brilliant” on the part of Charles. Apart from the military endeavours, Charles is considered to be a founding figure of the European Middle Ages. Skilled as an administrator as well as a warrior, he is credited with a seminal role in the emerging responsibilities of the knights of courts, and so in the development of the Frankish system of feudalism. Moreover, Charles—a great patron of Saint Boniface—made the first attempt at reconciliation between the Franks and the Papacy.Pope Gregory III, whose realm was being menaced by the Lombards, wished Charles to become the defender of the Holy See and offered him the Roman consulship, though Charles declined. He divided Francia between his sons Carloman and Pepin. The latter became the first of the Carolingians. Charles’ grandson, Charlemagne, extended the Frankish realms to include much of the West, and became the first Emperor in the West since the fall of Rome. Charles “The Hammer” Martel was the son of Pepin of Herstal and his second wife Alpaida. He had a brother named Childebrand, who later became the Frankish dux (that is, duke) of Burgundy. In older historiography, it was common to describe Charles as “illegitimate”. This is still widely repeated in popular culture today. But, polygamy was a legitimate Frankish practice at the time and it is unlikely that Charles was considered “illegitimate”. It is likely that the interpretation of “illegitimacy” derives from the desire of Pepin’s first wife Plectrude to see her progeny as heirs to Pepin’s power. After the reign of Dagobert I (629–639) the Merovingians effectively ceded power to the Pippinids, who ruled the Frankish realm of Austrasia in all but name as Mayors of the Palace. They controlled the royal treasury, dispensed patronage, and granted land and privileges in the name of the figurehead king. Charles’ father, Pepin, was the second member of the family to rule the Franks. Pepin was able to unite all the Frankish realms by conquering Neustriaand Burgundy. He was the first to call himself Duke and Prince of the Franks, a title later taken up by Charles. Finally, Charles Martel also had known a mistress, Ruodhaid, with whom he had the children Bernard, Hieronymus, and Remigius, the latter who became an archbishop of Rouen. Pepin the Short (German: Pippin der Kleine, French: Pépin le Bref, c. 714 – 24 September 768) was the King of the Franks from 751 until his death. 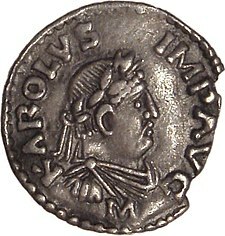 He was the first of the Carolingians to become king. The younger son of the Frankish prince Charles Martel and his wife Rotrude, Pepin’s upbringing was distinguished by the ecclesiastical education he had received from the monks of St. Denis. Succeeding his father as the Mayor of the Palace in 741, Pepin reigned over Francia jointly with his elder brother Carloman. Pepin ruled in Neustria, Burgundy, and Provence, while his brother Carloman established himself in Austrasia, Alemannia and Thuringia. The brothers were active in suppressing revolts led by the Bavarians, Aquitanians, Saxons, and the Alemanni in the early years of their reign. In 743, they ended the Frankish interregnum by choosing Childeric III, who was to be the last Merovingian monarch, as figurehead king of the Franks. Being well disposed towards the church and Papacy on account of their ecclesiastical upbringing, Pepin and Carloman continued their father’s work in supporting Saint Boniface in reforming the Frankish church, and evangelising the Saxons. After Carloman, who was an intensely pious man, retired to religious life in 747, Pepin became the sole ruler of the Franks. He suppressed a revolt led by his half-brother Grifo, and succeeded in becoming the undisputed master of all Francia. Giving up pretense, Pepin then forced Childeric into a monastery and had himself proclaimed king of the Franks with support of Pope Zachary in 751. The decision was not supported by all members of the Carolingian family and Pepin had to put down a revolt led by Carloman’s son, Drogo, and again by Grifo. As King, Pepin embarked on an ambitious program to expand his power. He reformed the legislation of the Franks and continued the ecclesiastical reforms of Boniface. Pepin also intervened in favour of the Papacy of Stephen IIagainst the Lombards in Italy. He was able to secure several cities, which he then gave to the Pope as part of the Donation of Pepin. This formed the legal basis for the Papal States in the Middle Ages. The Byzantines, keen to make good relations with the growing power of the Frankish empire, gave Pepin the title of Patricius. In wars of expansion, Pepin conquered Septimania from the IslamicUmayyads, and subjugated the southern realms by repeatedly defeating Waifer of Aquitaine and his Basque troops, after which the Basque and Aquitanian lords saw no option but to pledge loyalty to the Franks. Pepin was, however, troubled by the relentless revolts of the Saxons and the Bavarians. He campaigned tirelessly in Germany, but the final subjugation of these tribes was left to his successors. Pepin died in 768 and was succeeded by his sons Charlemagne and Carloman. Although unquestionably one of the most powerful and successful rulers of his time, Pepin’s reign is largely overshadowed by that of his more famous son. Pepin’s father Charles Martel died in 741. He divided the rule of the Frankish kingdom between Pepin and his elder brother, Carloman, his surviving sons by his first wife: Carloman became Mayor of the Palace of Austrasia, Pepin became Mayor of the Palace of Neustria. Grifo, Charles’s son by his second wife, Swanahild (also known as Swanhilde), demanded a share in the inheritance, but he was imprisoned in a monastery by his two half-brothers. At the time of Carloman’s retirement, Grifo escaped his imprisonment and fled to Duke Odilo of Bavaria, who was married to Hiltrude, Pepin’s sister. Pepin put down the renewed revolt led by his half-brother and succeeded in completely restoring the boundaries of the kingdom. 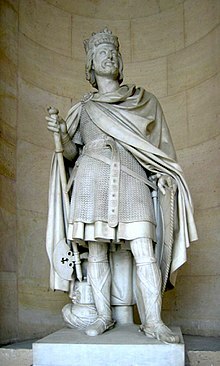 Under the reorganization of Francia by Charles Martel, the dux et princeps Francorum was the commander of the armies of the kingdom, in addition to his administrative duties as mayor of the palace. He built and trained a formidable army after the Battle of Toulouse in 721 where he had emerged as a successful commander. Pepin was assisted by his friend Vergilius of Salzburg, an Irish monk who probably used a copy of the “Collectio canonum Hibernensis” (an Irish collection of canon law) to advise him to receive royal unction to assist his recognition as king. Anointed a first time in 751 in Soissons by Boniface, archbishop of Mainz, Pepin added to his power after Pope Stephen II traveled all the way to Paris to anoint him a second time in a lavish ceremony at the Basilica of St Denis in 754, bestowing upon him the additional title of patricius Romanorum (Patrician of the Romans) and is the first recorded crowning of a civil ruler by a Pope. As life expectancies were short in those days, and Pepin wanted family continuity, the Pope also anointed Pepin’s sons, Charles (eventually known as Charlemagne), who was 12, and Carloman, who was 3. Pepin’s first major act as king was to go to war against the Lombard king Aistulf, who had expanded into the ducatus Romanus. Victorious, he forced the Lombard king to return property seized from the Church. He confirmed the Papacy in possession of Ravenna and the Pentapolis, the so-called Donation of Pepin, whereby the Papal States were established and the temporal reign of the Papacy officially began. At about 752, he turned his attention to Septimania. The new king headed south in a military expedition down the Rhone valley and received the submission of eastern Septimania (i.e. Nîmes, Maguelone, Beziers and Agde) after securing count Ansemund´s allegiance. The Frankish king went on to invest Narbonne, the main Umayyad stronghold in Septimania, but could not capture it from the Iberian Muslims until seven years later in 759, when they were driven out to Hispania. Aquitaine still remained under Waifer‘s Basque-Aquitanian rule, however, and beyond Frankish reach. Duke Waifer appears to have confiscated Church lands, maybe distributing them among his troops. In 760, after conquering the Roussillon from the Muslims and denouncing duke Waifer’s actions, Pepin moved his troops over to Toulouse and Albi, ravaged with fire and sword most of Aquitaine, and, in retaliation, counts loyal to Waifer ravaged Burgundy. Pepin, in turn, attacked the Aquitanian-held (urban, non-Frankish ‘Romans’) Clermont and Bourbon, defended by Duke Waifer’s Basque troops, who were overcome, captured and deported into northern France with their children and wives. In 763, Pepin advanced further into the heart of Waifer’s domains and captured major strongholds (Poitiers, Limoges, Angoulême, etc. ), after which Waifer counterattacked and war became bitter. Pepin opted to spread terror, burning villas, destroying vineyards and depopulating monasteries. By 765, the brutal tactics seemed to pay off for the Franks, who destroyed resistance in central Aquitaine (Waifer’s capital city Bordeaux fell in 767) and devastated the whole region. As a result, Aquitanian nobles and Basques from beyond the Garonne too saw no option but to accept a pro-Frankish peace treaty (Fronsac, c. 768). Waifer escaped but was assassinated by his own frustrated followers in 768. Pepin died during a campaign, in 768 at the age of 54. He was interred in the Basilica of Saint Denis in modern-day France. His wife Bertrada was also interred there in 783. Charlemagne rebuilt the Basilica in honor of his parents and placed markers at the entrance. Historical opinion often seems to regard him as the lesser son and lesser father of two greater men, though a great man in his own right. He continued to build up the heavy cavalry which his father had begun. He maintained the standing army that his father had found necessary to protect the realm and form the core of its full army in wartime. He not only contained the Iberian Muslims as his father had, but drove them out of what is now France and, as important, he managed to subdue the Aquitanians and the Basques after three generations of on-off clashes, so opening the gate to central and southern Gaul and Muslim Iberia. He continued his father’s expansion of the Frankish church (missionary work in Germany and Scandinavia) and the institutional infrastructure (feudalism) that would prove the backbone of medieval Europe. His rule, while not as great as either his father’s or son’s, was historically important and of great benefit to the Franks as a people. Pepin’s assumption of the crown, and the title of Patrician of Rome, were harbingers of his son’s imperial coronation which is usually seen as the founding of the Kingdom of France. He made the Carolingians de jure what his father had made them de facto — the ruling dynasty of the Franks and the foremost power of Europe. Known as a great conqueror, he was undefeated during his lifetime. Charlemagne (/ˈʃɑːrlɪmeɪn/) or Charles the Great[a] (2 April 742[b] – 28 January 814), numbered Charles I, was King of the Franks from 768, King of the Lombards from 774 and Emperor of the Romans from 800. He united much of Europe during the early Middle Ages. He was the first recognised emperor in western Europe since the fall of the Western Roman Empire three centuries earlier. The expanded Frankish state that Charlemagne founded is called the Carolingian Empire. European Royalty. Charlemagne was the oldest son of Pepin the Short and Bertrada of Laon, having been born before their canonical marriage. He became king in 768 following his father’s death, initially as co-ruler with his brother Carloman I. Carloman’s sudden death in December 771 under unexplained circumstances left Charlemagne as the sole, undisputed ruler of the Frankish Kingdom. He continued his father’s policy towards the papacy and became its protector, removing the Lombards from power in northern Italy and leading an incursion into Muslim Spain. He campaigned against the Saxons to his east, Christianising them upon penalty of death and leading to events such as the Massacre of Verden. Charlemagne reached the height of his power in 800 when he was crowned Emperor of the Romans by Pope Leo III on Christmas Day at Rome’s Old St. Peter’s Basilica. Charlemagne has been called the “Father of Europe” (Pater Europae),[c] as he united most of Western Europe for the first time since the Roman Empire and united parts of Europe that had never been under Roman rule. His rule spurred the Carolingian Renaissance, a period of energetic cultural and intellectual activity within the Western Church. All Holy Roman Emperorsconsidered their kingdoms to be descendants of Charlemagne’s empire, up to the last Emperor Francis II and the French and Germanmonarchies. Charlemagne died in 814, having ruled as emperor for thirteen years. He was laid to rest in his imperial capital city of Aachen. He married at least four times and had three legitimate sons, but only his son Louis the Pious survived to succeed him. The most likely date of Charlemagne’s birth is reconstructed from several sources. The date of 742—calculated from Einhard‘s date of death of January 814 at age 72—predates the marriage of his parents in 744. The year given in the Annales Petaviani, 747, would be more likely, except that it contradicts Einhard and a few other sources in making Charlemagne seventy years old at his death. The month and day of 2 April are established by a calendar from Lorsch Abbey. In 747, Easter fell on 2 April, a coincidence that likely would have been remarked upon by chroniclers but was not. If Easter was being used as the beginning of the calendar year, then 2 April 747 could have been, by modern reckoning, April 748 (not on Easter). The date favoured by the preponderance of evidence is 2 April 742, based on Charlemagne’s age at the time of his death. This date supports the concept that Charlemagne was technically an illegitimate child, although that is not mentioned by Einhard, since he was born out of wedlock; Pepin and Bertrada were bound by a private contract or Friedelehe at the time of his birth, but did not marry until 744. Charlemagne’s exact birthplace is unknown, although historians have suggested Aachen in modern-day Germany, and Liège (Herstal) in present-day Belgium as possible locations. Aachen and Liège are close to the region from where the Merovingian and Carolingian families originated. Other cities have been suggested, including Düren, Gauting, Mürlenbach, Quierzyand Prüm. No definitive evidence resolves the question. Charlemagne was the eldest child of Pepin the Short (714 – 24 September 768, reigned from 751) and his wife Bertrada of Laon (720 – 12 July 783), daughter of Caribert of Laon and Bertrada of Cologne. Many historians consider Charlemagne (Charles) to have been illegitimate, although some state that this is arguable, because Pepin did not marry Bertrada until 749, which was after Charles’ birth; this status did not exclude him from the succession. 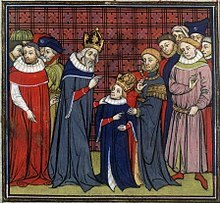 Charlemagne (left) and his eldest son, Pepin the Hunchback. Tenth-century copy of a lost original from about 830. During the first peace of any substantial length (780–782), Charles began to appoint his sons to positions of authority. In 781, he made his two youngest sons kings, crowned by the Pope. The elder of these two, Carloman, was made king of Italy, taking the Iron Crown that his father had first worn in 774, and in the same ceremony was renamed “Pepin”. The younger of the two, Louis, became king of Aquitaine. Charlemagne ordered Pepin and Louis to be raised in the customs of their kingdoms, and he gave their regents some control of their sub-kingdoms, but kept the real power, though he intended his sons to inherit their realms. He did not tolerate insubordination in his sons: in 792, he banished his eldest, though possibly illegitimate, son, Pippin the Hunchback, to the monastery of Prüm, because the young man had joined a rebellion against him. The sons fought many wars on behalf of their father. Charles was mostly preoccupied with the Bretons, whose border he shared and who insurrected on at least two occasions and were easily put down. He also fought the Saxons on multiple occasions. In 805 and 806, he was sent into the Böhmerwald (modern Bohemia) to deal with the Slavs living there (Bohemian tribes, ancestors of the modern Czechs). He subjected them to Frankish authority and devastated the valley of the Elbe, forcing tribute from them. Pippin had to hold the Avar and Beneventan borders and fought the Slavs to his north. He was uniquely poised to fight the Byzantine Empire when that conflict arose after Charlemagne’s imperial coronation and a Venetianrebellion. Finally, Louis was in charge of the Spanish March and fought the duke of Benevento in southern Italy on at least one occasion. He took Barcelona in a great siege in 797. Pepin or Pippin (or Pepin Carloman, Pepinno, April 773 – 8 July 810), born Carloman, was the son of Charlemagne and King of the Lombards (781–810) under the authority of his father. Pepin was the second son of Charlemagne by his then-wife Hildegard. He was born Carloman, but was rechristened with the royal name Pepin (also the name of his older half-brother Pepin the Hunchback, and his grandfather Pepin the Short) when he was a young child. He was made “king of Italy”after his father’s conquest of the Lombards, in 781, and crowned by Pope Hadrian I with the Iron Crown of Lombardy. Bernard (797, Vermandois, Picardy – 17 April 818, Milan, Lombardy) was the King of the Lombards from 810 to 818. He plotted against his uncle, EmperorLouis the Pious, when the latter’s Ordinatio Imperii made Bernard a vassal of his cousin Lothair. When his plot was discovered, Louis had him blinded, a procedure which killed him. 17th century commemorative fresco from Bernard’s grave in Milan, Italy. Bernard was born in 797, the illegitimate son of King Pepin of Italy, himself the son of the Emperor Charlemagne. In 810, Pepin died from an illness contracted at the siege of Venice. Despite being illegitimate, Bernard was allowed to inherit Italy. Bernard married a woman named Cunigunde, but the year of their marriage, and her origins are obscure. Some sources refer to her as “of Laon”. They had one son, Pepin, Count of Vermandois, who was born in 817. Pepin II (French: Pépin; 817 – after 850) was the first count of Vermandois, lord of Senlis, Péronne, and Saint Quentin. He was the son of King Bernard of Italy (a grandson of Charlemagne) and his Queen, Cunigunda of Laon. Pepin III (c. 846 – 893), count of Senlis and lord of Valois (877–893), Count of Valois(886–893). Herbert I of Vermandois (c. 848/850 – 6 November 907), Count of Vermandois, Count of Meaux, Count of Soissons, and lay abbot of Saint Quentin. He was a Carolingian aristocrat who played a significant role in Francia. Herbert was the son of Pepin of Vermandois. Herbert became count of Soissons before 889 and was probably charged with defending the Oiseagainst Viking intrusions. A contemporary of Baldwin II, Count of Flanders he had the advantage of being a Carolingian, a great-grandson of Pepin of Italy, a son of Charlemagne. Herbert controlled both St. Quentin and Péronne and his activities in the upper Somme river valley, such as the capture and murder (rather than ransom) of his brother Raoul in 896, may have caused Baldwin II to have him assassinated in 907. Herbert arranged a marriage alliance to Robert of Neustria by giving in marriage his daughter Beatrice as Robert’s second wife. As a part of this pact Herbert also agreed to his son Herbert II of Vermandois marrying Adela, Robert’s daughter by his first wife. Cunegonda of Vermandois († aft. 943) who married Eudo, Count in the Wetterau. Béatrice of Vermandois (c. 880 – after March 26, 931), a Carolingian aristocrat, the wife of Robert I, King of France, and mother of Hugh the Great. Beatrice, born c. 880 was the daughter of Herbert I, Count of Vermandois.She was also the sister of Herbert II, Count of Vermandois, and was a descendant in the male line of Charlemagne through King Bernard of Italy. [a]Through her marriage to Robert I, she was an ancestress of the Capetian dynasty. On 15 June 923 her husband Robert was killed at the Battle of Soissons shortly after which their son Hugh was offered the crown but refused. Beatrice died after March, 931.